My poster for Steve’s talk, with his updated title. A small but dedicated audience, including a newcomer, managed to remember that this talk wasn’t on the last Thursday of the month, although we return to that pasttern next month and will adhere to it strictly in future! 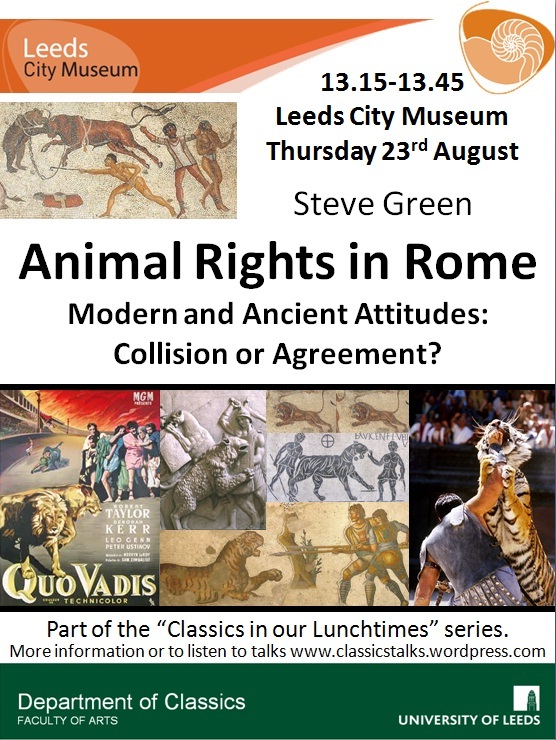 Everyone enjoyed a brief talk which encouraged us to think about animal rights in a broader context in both the ancient world and as part of our lives today. A fascinating discussion roamed freely both inside and outside the arena and made use modern parallels, helping us to develop our thinking. We discussed allsorts of things, from the Romans’ perception of elephants as the most human animals, to pets, to animal sacrifice, to legion mascots (apparently, Roman legions had animal mascots, not just animal standards/emblems: there is a grave of a monkey dressed as a signifer… But does this show affection/regard or is it humiliating for the animal? Can modern debates about regimental mascots help here?). We don’t record question sessions, but some further information on dogs, cats and birds in Rome outside the games that reproduces some of the information – if not the issues – from the session can be found here.